The human brain contains billions of neurons, and these neurons interact in a variety of ways that are only beginning to be understood. One of the great challenges that humans confront is determining the way in which the human brain can support complex behaviors such as reading and understanding this text. We can begin to confront this challenge by improving our understanding of human neuroanatomy. Michael Petrides is an internationally renowned neuroanatomist. 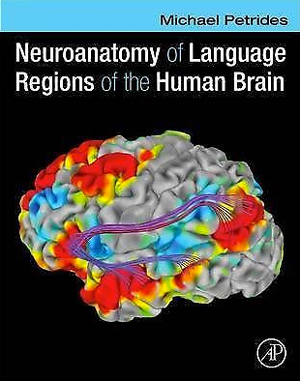 His new, large format book is titled, “Neuroanatomy of Language Regions of the Human Brain.” The book is generously illustrated in color, including unique illustrations from his own work. The illustrations are clearly labeled. The accompanying text is authoritative and describes the relevant anatomical features in clear language. The book is divided into three major sections. The first section of the book focuses on gross anatomy of the human brain. There is a comprehensive discussion of the gross morphological features of the brain. This is accompanied by images that can be obtained with MRI. Petrides illustrates gross anatomy in axial, sagittal and coronal orientations with a T1 sequence obtained at 3 tesla with 1 mm isotropic voxels, but few additional details of the imaging sequence are provided. These illustrations are useful since most volumetric imaging is obtained at 3 tesla with 1 mm3 voxels, although a 7 tesla scanner may have illustrated the anatomy with additional detail. Slices are provided at approximately every 4 mm. Each slice is associated with an orienting location in the space of the Montreal Neurological Institute ICBM152 generation VI average brain, and most sulci are labeled on each slice of each image. The second section of the book focuses on cytoarchitecture. Large format images are provided that illustrate the layers of the cortex from each of the critical areas of the brain. Brodmann labeling is used for most illustrations, although Economo and Koskinas labels are used for some critical areas. The location of most samples is illustrated with images of gross location on a brain illustrating Brodmann’s areas, and some corresponding anatomic loci in the macaque monkey brain are also provided. The third section of the book describes the named, long white matter projections of the human brain. Corresponding projections in the macaque monkey brain are illustrated as well. White matter connectivity is illustrated primarily within the left hemisphere, and hemispheric differences are not detailed. In addition to the averaged results of white matter projections, in situ tractography in individual subjects is provided to demonstrate each of the major white matter fasciculi. The text provides an important discussion of the distinction between the superior longitudinal fasciculus and the arcuate fasciculus, and considers in detail the dual-route hypothesis the postulates dorsal and ventral projections between anterior language regions in the frontal lobe and posterior temporal language regions. Petrides provides an interesting historical discussion of the development of our understanding of the neuroanatomy of language, beginning with Pierre Paul Broca’s revolutionary presentation of Leborgne and Lelong. He also provides interesting illustrations of MRIs of the brains of these two patients. Major figures such as Wernicke, Marie and Dejerine are mentioned as well, although other seminal early investigators such as Lichtheim are not acknowledged. Petrides also reviews the seminal electrical stimulation studies of Penfield. Indeed, interesting historical perspectives are provided throughout the book. It is appropriate that a volume about neuroanatomy focuses on language since this topic is the historical origin of our study of human cerebral anatomy. Petrides notes at the beginning of the book that most areas of the brain are arguably related to language. The focus of the book is tilted toward the language regions of the brain, but Petrides generously describes essentially all cerebral regions and provides key illustrations from macaque monkey. A truly positive feature of this book is the multiple perspectives that are adopted in a single, comprehensive volume. An additional perspective might have been provided by the anatomically based neurotransmitter work from Zilles and Amunts. 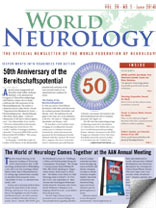 This book was reviewed by Murray Grossman, professor of neurology, director of the Fronto-TemporalDementiaCenter at the University of Pennsylvania School of Medicine.